Spotlight stamping is easy to do, just pick out the part you wish to "spotlight"
When you need a card in a hurry, try "Spotlight Stamping" for quick results, and especially if you don't like coloring in. 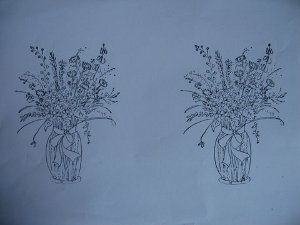 For this simple technique you will need to choose the image you want to use and stamp it twice onto some white cardstock. I used a black ink pad for a crisp impression. One of these images will be used in full size and the other will be cut into a section to make the spotlighted area. 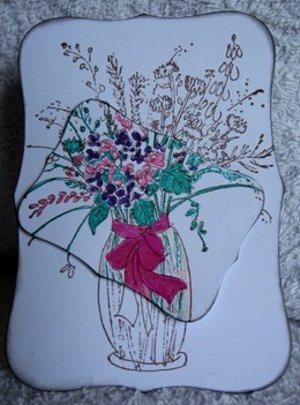 I have used my "Spellbinders" die cuts to shape the full image and a smaller one for the spotlight. And I have placed it at an angle for a little more effect. 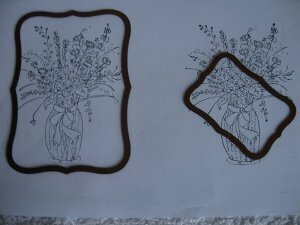 You could use other ways to shape your cards, or just cut freehand a strip across the second image and use it that way. Punch out a star, oval, circle or oblong shape, just keep the spotlight one smaller than the main image, whatever you decide to do. Ink the edges of both pieces to add definition to your shape, but the larger image stays un-colored. Color in the smaller shape in your chosen medium. But it could be watercolored or chalked...your choice! When the coloring is dry it can be attached to the main image using foam pads to raise it up. Make sure that you line up the elements of the images to complete the card. And the final step is to add the finishing touches to your creation. Choose the backing paper to match your card and colors. I matted and layered my papers, and the stamped image with a purple mirror card. I wrapped a white organza ribbon around the layer. 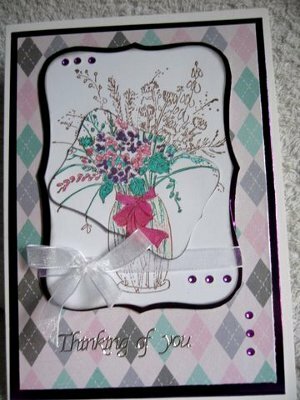 Gemstones, Glitter, buttons and bows, or any embellishment you care to use can all make this card something really special.